It is all quiet here now. There’s the soft sound of watery white noise through the monitor and Alannah coughing intermittently. My parents have gone home. Darren has gone to bed. He isn’t sleeping much or well. I have a cup of tea and my notes from our telephone call with Dr P this evening. He listened. He answered our questions. He reassured us. Perhaps it was my initial judgment that was post-haste. He ran us through the basics to begin. Ameloblastomas are locally aggressive, destroying much around them but not damaging further afield. My ameloblastoma is the multi-cystic or multi-locular variety, meaning there is more than one area of erosion of the bone. Only the unicystic variety of ameloblastoma is treated conservatively. The other types, including mine, are treated aggressively with resection with a wide clearance. That’s roughly a 2cm to each side of my 10cm damage zone. The incidence of malignancy in ameloblastomas is fairly small, he said. They like to check. The recurrence rate for benign ameloblastomas is high. With the aggressive resection he undertakes, however, he thinks the recurrence rate is less than 15%. I don’t believe we touched on the recurrence rate for malignant ameloblastomas. The MRI scan enables them to see the difference between the spongy and hard bone. It showed the tumour had breached through the cortex into the soft tissue. That, if I understood correctly, is the area of concern on which they will focus their attention in the second biopsy this Saturday. They will send the biopsy samples to a pathologist for examination under a microscope. They will look for signs of ameloblastic carcinoma or sarcoma. They’ll look to see if there is infiltration of the lymph nodes or blood vessels, if there is potential to metastasize (spread to other parts of the body), and how the cells look. Can the pathologist say for certain? Will you need a second option? Malignant ameloblastoma can be difficult to diagnose, he agreed. The pathologist at Westmead Hospital for my original biopsy is a world leading figure. He will ask a pathologist at Royal Prince Alfred Hospital to take a look. The pathologists in this field all know each other and usually like to pass it around to get others’ opinions. A group of them get together formally every Friday fortnight and may look at it together. All in all, it’s a lengthy process. It may take one to two weeks for the results of this second biopsy. The results of the first biopsy took nearly two weeks. I won’t know until right towards the end of June. If the biopsy results do not come back as clearly benign, I’ll likely have a CT PET scan. Cancer cells, among others, take up glucose and the radio-isotope scan will show if this is happening in my jaw. Whether they think the tumour is benign or malignant, the treatment is aggressive: resection with a wide margin and reconstruction. If they still think the tumour is benign but locally aggressive, they will only take our my level 1 and 2 lymph nodes. This will allow them the access they need to get the fibula flap in through my neck to reconstruct my jaw. If they think the tumour is cancerous, they will take out the level 3 lymph nodes as well. These are located below the jaw in the glands. Waiting on the biopsy results alone and leaving the CT PET scan aside, this brings us right up to school holidays. Can he be sure that the tumour won’t cause more destruction in that time? Even if the tumour is benign, could the joint at the top of my jaw not be compromised in that time? In his 25 years experience in this field, he has only once or twice seen the jaw joint removed. The tumour has probably been growing for years and he would prefer to wait to have all the information available. If he is allocated an operating room by the hospital, he assured us, he can operate the day he is back. That’s mid July. A month away. In March 2007, they found a cyst on my right ovary when it hemorrhaged. It had grown to 10 by 15 cm when they operated to remove the cyst in June or July that year and decided to remove the ovary and appendix as well because the cyst looked pre-cancerous. It wasn’t, but the danger of delay is on my mind. However, he mused, did I know the ovaries were the most common location for tumours? And did I know the second most common? Yes, the jaw. Lucky me. He is happy to see us all before the surgery. He’ll show us the scans and answer any more questions. He can also arrange for me to meet the young man on whose malignant ameloblastoma he recently operated. Yes, I said, I’d appreciate that. Then somehow, almost as we hung up, the kicker. Even this biopsy coming back as benign will not exclude malignancy. Only examination of the full tumour under a microscope can do that. And on that bright note, we said our goodbyes. Today brought our post-op appointment with Dr S to talk brass tacks. He has been very reluctant to discuss the heavy stuff over the phone, but he has certainly been busy on my case. But first, a bit more on my new friend Blaster. The pathologist got up close and personal with her under the microscope. There are four main types of ameloblastoma – cystic, solid, soft tissue and malignant – and my girl’s the solid type. The pathologist does not think she is malignant. What she does have is “concerning characteristics”. She “exhibits basaloid features with evidence of apoptosis and occasional mitoses” but “unequivocal malignant features are not observed”. Once we part company, she’ll be finely sliced and diced just to be sure. But, of course, the question is what to do about her? There is really only one option, he said: resection. The entire tumour must be surgically excised. Even though she is solid, her borders are not perfectly defined and a margin around her must also be removed. That’s 1cm give or take. Here is Blaster again in technicolour. She is ringed in turquoise. 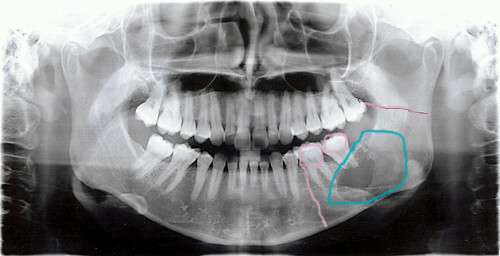 She extends further than is obvious on the first x-ray, indeed into the soft tissue below the second back molar. The approximate borders of the resection are in pink. Yes, ouch. It’s all got to go. The soft tissue, the jaw bone (such as it is), the nerve that allows me to feel the left of my lower lip, another of the back teeth. The further back of the two teeth I have circled, known affectionately as mobile tooth 37, was removed during the biopsy. Mobile because her roots had been eaten away and she had the wobbles. So one down, one to go. Then comes the reconstruction. There’s not a lot of bone left now that Blaster has had her fun. They will need to insert a titanium plate to hold me all together and graft a bone from either my hip or fibula (lower leg). At some later stage, he said, they can refine here and there, implant teeth or fix up the symmetry of my face. Luckily, as Deb pointed out, my super model days are already over. Phew, one less thing to worry about there then. The good news is that, contrary to what seems to be the experience of the American kids on my facebook group, this should not be long and drawn out. It’s likely a single surgery for the resection and reconstruction over about 5 hours. Thankfully, with proper resection, the likelihood of recurrence is very low. Again, not the experience of my new American amelo buddies. I’m looking at a 2-5 day hospital stay, followed by a few months recovery. I’ll probably be out of sorts for a week or two. He suggested Darren taken two weeks off to look after me. (Aww bless.) I’ll be on a liquid/puree diet for about a month, then soft foods for quite a while. All going well, I should be looking fairly normal within a month or so. Now, I said Dr S had been been busy. It turns out I am not that much younger than his wife and he has been thinking what he would want for her. The big decision is where to be treated. While I could continue to be treated in the public system at Westmead Hospital, his experience is in the less nasty end of jaw tumours and we would no longer be under his wing. Ever thoughtful, he runs through our options. He is keen to help us decide and smooth the way for us. He would like to refer us privately to another oral and maxillofacial surgeon with greater experience. He has in mind a surgeon with whom he has worked and for whom he has great respect, let’s call him Dr P. Dr P operates in Sydney out of the swanky new Macquarie University Hospital. He is happy to refer us elsewhere if we wish and has a second name for us, a surgeon he has heard good things about but does not know personally. Should we get a second opinion? He doesn’t think so. While it is not cancer and there is no rush, he would like the surgery to take place in the next 4-6 weeks, if not sooner. No rush then! With a tumour of this size and aggression, there really is no option other than resection. The priority is to get it all out. Soon. Great, we say, let’s do it. Always one step ahead, he has spoken at length to Dr P about our case and secured an appointment for us at 2.15pm tomorrow. It’s sad to farewell Dr S. He’s been a gem. He says he’ll keep an eye on me and how it all goes and we have his number. Bless his cotton socks. So my dear readers, to be continued… See you back here tomorrow, same time, same place. Note to self, I might call my mother first though. In my pitiful defence, it’s been a sucky day with pain. I have been sucking down the pain killers more than I care for and I went back to bed this morning and again this afternoon. On a brighter note, Alannah had a wonderful play date with Maxie and Adi. Big thanks to Tash for looking after her and Deb for pulling her dusty self out of bed after mothers group dinner last night to join them. What would I do without you all? Not unexpected news. Indeed, exactly what I expected. I’m not feeling shocked or deflated or scared. I felt ready for it, which surprised me. A week of devouring everything I could find on ameloblastoma helped. But it is the worst case in the range of scenarios we had discussed with Dr S. He’d initially hoped Odontogenic Keratocystic Tumour when he first met. After our second meeting together with Dr D, he was leaning towards Unicystic Ameloblastoma. He first conceded the likelihood of Ameloblastoma when he called to check on me the day after the biopsy. Alannah and I were at Centennial Park with El and Tess when Dr S called early this afternoon and I dragged the diagnosis out of him. We walked and talked while the girls slept then explored the playground, ate dirt, tasted sand and caught a little sunshine. All this to say I’d had an hour or two to digest the news before I got home and called Dad and Mum. Here I am thinking I should get it over and done with like ripping off a bandaid. Little did I know. The first question from each: oh good, so it is definitely not cancer, right? I am the bearer of good news, it seems. Dr S has assured us from the start that it’s not cancer. To say he is loathe to be definite is somewhat of an understatement. That’s the big news of the day. No no, I forgot! Alannah can definitely stand from sitting and is proud as punch. She has done it quite a few times, but not as repeatedly or joyously as today. He asked about pain. I said, heck yes. Well, words to that effect. He took a lot of biopsy samples, he said, once he’d seen how the tumour looked. That is exacerbating the pain. I asked about the bismuth-iodine pack that he was going to insert during the biopsy to begin the marsupialisation treatment. A treatment that is likely off the table with this diagnosis. A day or so after the biopsy, there didn’t seem to be the iodine taste he’d suggested and I began to think he hadn’t put in the pack. Correctly, as it turns out. Once he saw the tumour, he didn’t want to put me through that unnecessarily. I also asked about the soft food fun. Yes, he said, I need to keep on the soft foods and absolutely avoid hard foods. No steak or apples, we agreed. So looks like Alannah and I will be sharing fish fingers more often. He did stress that he is still waiting for some bits or pieces, second opinion perhaps, to finalise the pathology. He’s a little perfectionist, my man Dr S. I know he knew the minute he saw the tumour, but I’m happy for him to do his thang. I’m glad this part is done and dusted. Now to move on The Plan on Thursday. The more information I have, the easier I find it to get my head around all this. I have been surprisingly calm waiting for the biopsy results. Dr S did say to call him anytime I had any questions. So this morning I asked him the list of questions I’ve been building up over the last day or so. I know you are going to call me, but do you have the results of the biopsy yet? They may not be ready by Tuesday, he said. There’s a fair bit involved and it takes time. I was thinking of you and we could make an appointment at my Balmain offices on Thursday when the results will definitely be back and which will also much easier for you. Yes, I agreed, my husband can also come then, but I still really want you to call when you have the results. Of course. I still have a loss of sensation, a kind of pins and needles in my left half of my lower lip. Should that have gone away? Will it go away? That is normal, he said. But it may not go away. It depends on the pathology and the surgery. If the tumour is benign aggressive and wrapped around the nerve, then we may need to remove it. You will get used to it and adapt, he assured me. I have run out of panadeine forte. What should I take for the pain? Two panadol to start, then two nurofen if that is not enough. Two of each at the same time is fine. I’d want you to come off the panadeine forte in any case, he said. I am feeling very tired. Is that related to the panadeine forte? Will I feel better on panadol and nurofen? Yes, the panadeine forte and the anaesthesia from the surgery. You will probably feel better. I know you are now thinking it is less likely to be a unicystic ameloblastoma. I know you can’t say until the biopsy results, but it just helps me to have an idea of the worst case scenario? I don’t want you to worry. [etc etc then finally] The worst case is ameloblastoma, not the unicystic type. Ah, I said, that is what I had already thought. And that means resection, bone grafts, etc. Yes, he said, but we don’t know until we have the biopsy results. Yes, I don’t like to hear my thinking confirmed. But I have already read a few ameloblastoma blogs (already linked in on my blogroll) and I have already joined the yahoo ameloblastoma support group. There’s a facebook page too that Tina from the Renewing Strength blog has set up that I might join. All this to say that I have a fairly good idea of what might be in store for me. And I didn’t burst into tears. Darren gave me a big hug though. I have only had three bouts of tears so far. First, telling people in those first raw few days after they found the tumour. Third, when my lovely neighbour and husband organised a little present for me: Aesop “Breathless” scented oil and a few other bits and pieces. Then I balled. And again on telling my mum about it. Little presents like that mean so much. Thinking of it is making the tears well up again now, so enough of this. Time to start my day. I have a tumour in my jaw. Not cancer, the surgeons assure me. While they believe it is benign, it is large and aggressive. Aggressive is their word for destructive, the tumour having already stretched and eaten into the mandible bone in my jaw until paper thin. It is not the worst news, but it’s not good news either. It’s going to be a long road though – at least 12 months, leaving aside possible recurrence – and I’m not entirely sure what to expect. A biopsy is the only way to diagnose for certain, but it’s likely either a keratocystic odontogenic tumour or unicystic ameloblastoma. If that’s the case, the plan is to “marsupialise” the tumour: it should shrink of its own accord over 8-18 months if exposed to the mouth with the wound packed with an iodine-bismuth pack and held together with a few stitches. They then plan to surgically remove the tumour and any surrounding “daughter cysts”. Pain in my tooth, or maybe my jaw. I am due for my six monthly dental appointment. I tell the dentist that my left back tooth is really sore. He asks if I am flossing. Yes, I say, but I think I am missing the back tooth on each side. I only need to floss the teeth I wish to keep, he jokes. He takes an x-ray of my teeth, the x-ray that was overdue as I was pregnant at the appointment before last. As it turns out, the x-ray is only of the teeth and does not cover the gum or bone area at all. For the next month, I determinedly floss all the way to the back every night. The pain does not go away, but I figure that it is self-inflicted so I don’t complain, even to my husband. In the evening, I feel around the sore back left tooth and discover a lump. I can’t tell if it is on the gum or the cheek but it is definitely a lump. I enlist my poor husband to have a look. It’s definitely a lump. I’m worried it’s a tumour so he suggests I call Health Direct. The nurse says it is likely an abcess but I should see my dentist as soon as possible. It being a Friday, I should see a doctor in the interim. I leave a message on my dentist’s answering machine asking for an appointment on the Monday. The doctor thinks it is either an abcess or a blocked saliva duct. He definitely doesn’t think it is a tumour as I fear. He prescribes antibiotics. The dentist squeezes me in at 8.30am and has a good feel around. He assures me the lump was not there four weeks ago and sends me down the road for a full mouth scan. As I take the scan back to my dentist, I take a peek. Even I can tell there is a black growth on one side and not on the other. It’s a type of cyst, my dentist tells me. It’s not good. He calls around and gets me an appointment with an oral surgeon for the early afternoon. The oral surgeon, Dr S, confirms it is a type of tumour and runs through the options. The only way to diagnose for certain is a biospy. In his best case scenario, the tumour will shrink through marsupialisation over 8-18 months and then be surgically removed. In his worst case scenario, he will need to remove a large section of the jaw and replace it with a titanium plate, etc. I have a CT scan. We both like this surgeon so decide to go with him, even though he operates out of Westmead Hospital in the west of Sydney and around 40 minutes drive (at best) from where we live in the east. We see the oral surgeon again. He shows us the CT scan. We decide on a plan. The biospy is scheduled for 30 May at Westmead Hospital and we need to go out on 24 May for pre-op administration. We meet with Dr S and a second oral surgeon, Dr D.
They now think it may be the worse of the two options because of the nature of the growth but, again, emphasise that it is all speculation until the biopsy results. Biospy under general anaesthetic at Westmead Hospital. Day surgery only. With Dr S and Dr D.